Shopping and prepping on Sunday is time well spent that can make the whole week ahead easier. 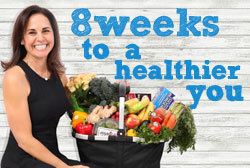 It will help keep you and your family on track for a healthier diet throughout the week. Start by looking through your refrigerator and remove expired food. 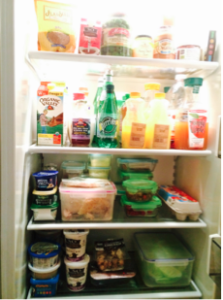 While removing items go through your fridge and produce drawer. Next, make a list of what you need to purchase. Stack all the Tupperware with items that need to be pitched near your kitchen sink to be washed. Then throw away all of the other veggies and herbs that are not fresh. After cleaning the kitchen ask your family if there are any special meals or grocery items they would like and add them to your list. Next, armed with the grocery list and a meal plan, set out to the store or, in the spring and summer, the local farmer’s market. 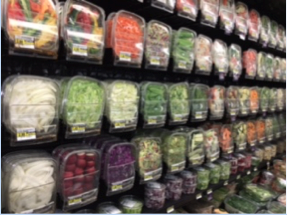 Try to buy your produce twice a week for the freshest ingredients possible. Also, shop for items at Costco once or twice a month for organic chicken, wild caught salmon and other fish along with an array of organic veggies and fruit. When you get home, unpack your groceries and put the produce next to the sink. Put everything else into the fridge or pantry. Move the other remaining vegetables from the fridge and add them to what’s there. If any one were to come into my kitchen during my prep time, it would look like a chaotic, somewhat organized mess. I highly recommend getting help from other family members as well. If you can afford it, hire help or train a sitter or housekeeper to do some of the prep work so that you have what you need at hand. 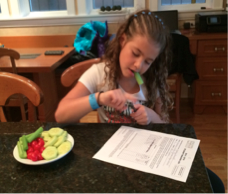 Cut fresh veggies for snacking. Use them for grab and go and on the run snacks. Put them on the counter when your kids come home from school. This way they have good things to eat instead of mindless, nutrient deficient junk food. When your spouse comes home from work ravenous, try to have fresh cut veggies and some fresh guacamole to dip the veggies in. This tactic will tide them over until dinner. Begin by chopping the staples; onion, carrots and celery. Even better, if you have enough veggies precut from your mid-week meal prep you can sauté them while cutting more. Always have onion, carrots and celery precut as a base for a soup. If short on time, purchase it pre-cut from Trader Joe’s , Whole Foods, Mariano’s, Fresh Thyme or the Jewel. Here is a picture from the Jewel the other day. You may pay a premium, but there are really no excuses when you’re short on time. 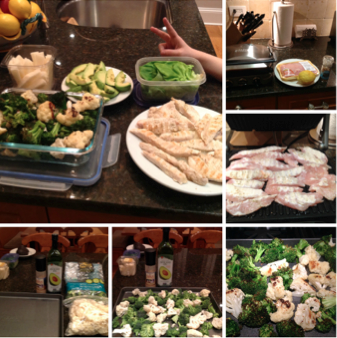 The pictures below are of two meals prepped at one time with some of the same ingredients for a soup and an egg bake. I sautéed chopped onion and mushrooms in olive oil for both the soup & egg bake. I used yesterday’s broccoli garlic and olive oil & chopped it up to add to the egg bake along with the other half of the onion and mushrooms. I used yellow squash, zucchini, turkey bacon and half of the onion & mushroom mixture for the egg bake. The meal prep for the two dishes in the photos are super easy. I took Belle & Evans organic chicken tenders and put the Trader Joe’s Garlic and Salt grinder spice and olive oil on the Cuisinart grill (like a George Forman). The chicken is easy to put over a salad or eat plain as a snack. For this meal I washed butter lettuce and cut avocado to make chicken tender lettuce wraps. I often cut my own Jicama, but decided the luxury and the expense to buy it precut was worth it. I pre cut the cauliflower the day before and bought precut broccoli at Costco. I drizzled olive oil and Himalayan salt and pepper over the veggies and baked them at 375 for 20-25 minutes. In the last few minutes, I put it on broil, but watched it closely to remove from oven when a little brown. After we’ve finished eating the meal, I fill snack size bags or small Tupperware with left overs to snack on. 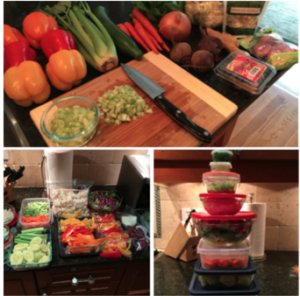 Your family will eat better quality food over all when you take the time to plan and prep your meals. When you go to the grocery store always have in mind to shop the periphery of the store. This is where the produce and meat sections are. To minimize buying processed food, avoid most center aisles. Look for organic plant based REAL food along with organic chicken and turkey, lean grass-fed meats and wild caught fish. Eat only high quality dairy and eggs. Use good fats and focus more on eating the RIGHT fats, such as olive oil, avocado oil and coconut oil. It will make your whole family feel better and believe it or not think much better. With this method and regular planning your family will bring home less take out food, eat out less often and save you a lot of money. This drawing is from the book, NDD (Nutrition Deficit Disorder). Every parent should read it! I believe that “Health Reform” needs to start in our own kitchens. You have the power to choose to eat well and get educated for a lifetime of great health and longevity. 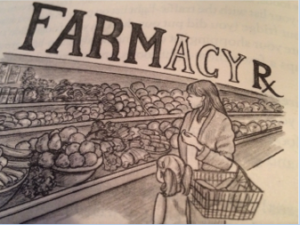 Think about who makes the choices of what goes into your family’s grocery cart? It’s usually the parents. The choices will have a direct effect on the health of your whole family. I know it takes a big commitment in time to start to think this way, but you and your family are worth it! Mine Is!